I've suffered from allergy related issues nearly my entire life. In kindergarten, I ate a black-walnut cookie and almost immediately felt ill (that story here). Additionally, I end up with hives when I ingest certain antibiotics. Given my apparent sensitivities, I count myself lucky that I've never suffered an extreme reaction to an allergen. I'm especially watchful of signs of allergies in my children. This spring I applied some sunblock lotion to my one-year-old son and his face swelled up and turned red. His reaction scared the daylights out of me. 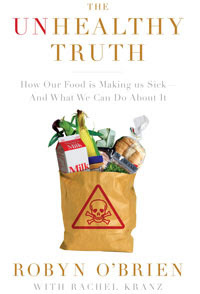 Just recently I received a review copy of O'Brien's book titled, The Unhealthy Truth: How Our Food Is Making Us Sick - And What We Can Do About It . Robyn is passionate crusader in the food allergy world and founded AllergyKids to help raise awareness of food allergies in children. Her book details her research into food allergies and discusses the possible links to food engineering and the introduction of food additives and dyes into the food supply as a cause for an increase in childhood food allergies. Taking care to note several sources, she takes on the corporate world and chides the U.S. government for not doing enough to protect our children from toxins, citing that European countries have much stricter food regulations. And she offers helpful solutions for parents who want to make a change to a healthier, chemical free, more organic diet. The book is written in such a way that the average person can understand the basics of allergies and the science behind genetically altered food. Like many moms, I do worry about what I feed my children. And like most time-strapped moms, I know how difficult it can be to put a healthy meal on the table. It seems far easier to use the pre-packaged, processed foods so readily available. However, some of the revelations in O'Brien's book certainly make me think twice about what I feed my family. I was very interested to learn about genetically modified foods (particularly soy). The corporate/government/medical world inter-relations also alarmed me. I like her 80/20 rule, where parents should aim for 80% of the diet to be healthy and realize that sometimes junk food (the 20%) is inevitable. I myself believe in variety and moderation. Yes, O'Brien is just a mom, not a medical scientist. But, her main goal is certainly a worthy one: to offer information, to empower consumers, and ultimately she hopes American parents make the shift toward a healthier, more organic diet. This is a worthwhile read for all parents and concerned consumers. Win a copy! Thanks to Broadway Books (3) Brimful Curiosities readers will receive their own copy of The Unhealthy Truth. This sounds like a really important book, and way scarier in a way than those summer thrillers I read! Please enter me! I would be honored to support your work and sign the book for your giveaway. Your work is so important and your voice so powerful. Would you consider posting your review on Amazon for other mothers to see, as your heart speaks so eloquently as a mother! Food supply issues are of high interest to me and since I just had a baby, I'm already worrying about feeding him. Have you read the Michael Pollan books? I've been trying a raw food diet lately, which means I don't have any of the additives in my food right now. I have to say that I feel better. This sounds like a informative read! It's so interesting (and scary) to see what is really in our food! Would love to read this...please enter me in your giveaway! This book sounds so informative, I would like to read it and pass it on to my daughter. She is having problems with food allergies with my grandson. Please include me in your giveaway. I would love to eat organic food all the time but I can't always afford to buy the healthiest stuff. This looks fascinating! I'm always concerned about food contamination and such, especially after reading Jenny McCarthy's experiences with additives, etc. I have suffered from allergies for a great portion of my life. I'd love to know how to put them aside and have a happy and fulfilling life. Sound like the book for me. This sounds like a very interesting, informative read; I've been taken a much greater interest in my diet and how it effects my health. Thanks! As a mom to two children with some food allergies this sounds like a must read for me! Thanks! I'd like to read this. My two kids are really young, and I could learn a few things. Ever since I got sick, I have been intolerant to a lot of food. As of now, I have cut out wheat, dairy, gluten, anything unbleached, processed, culturized. No artificial anything and definitely no HFCS. As far as I know, I don't have any food allergies, but I am concerned about food safety. It's scary what we don't know about what we're eating! My daughter has allergies - this would be interesting to read! One of my children has food sensitivities, so I have a special interest in this subject. Thank you for offering this giveaway, and for keeping us informed about other ones. I have subscribed to your blog via email. Actually, I could use this book for myself. I have lupus and RA and think that many times it is the food that I ingest that make them even more uncomfortable. Due to some recent (and as yet unexplained) GI issues, I have been doing some experimenting with different foods on my own (eliminating some, adding others). I think this book would be EXTREMELY helpful in my quest! I'm terrified my boys will end up with allergies of some kind. I have a 2 year old and an infant. This would be an interesting book to read, given my son's allergy to milk as an infant. I'm very concerned about what we put into our bodies. I'm a vegetarian but I know there's more I can do. I would love to read this. I have one with allergies and would love to read something that might help her! This book looks very interesting. As a mom, I encounter the "what to feed my child" decisons every day. Being armed with as much information as possible is the best way for me to make those decisions! This is a very good book to have or i can even share with another parent who will need it too. I would love to give this to my sister who has to adhere to a GF diet for her family. I've been trying to serve my family less processed, organic food. This book sounds like it would provide additional information to help me with this. Please enter me in this giveaway. This wold be a good book for my family- both my kids have food allergies! I have 2 kids I'm trying to raise with healthy habits/lives and this would be an informative book to utilize. This is such an important topic about which I often feel alone. I struggle against family members, including DH, while trying to provide the best food for my children. Awareness of our food reality is key to change. I would absolutely love to read this book and then kindly pass it on to my unaware friends and family. :) Thanks! It seems like everyday I hear about another food that causes cancer, or some other disease - pretty soon there will be left nothing left to eat!